Join Us For Coverage Of Inauguration Day; Here's The Schedule : The Two-Way The president will take the oath of office and deliver his second inaugural address at midday. We'll be live blogging. Among the highlights: The president's remarks, which are due to begin at noon ET; performances by singers James Taylor, Kelly Clarkson and Beyonce; inaugural poet Richard Blanco. 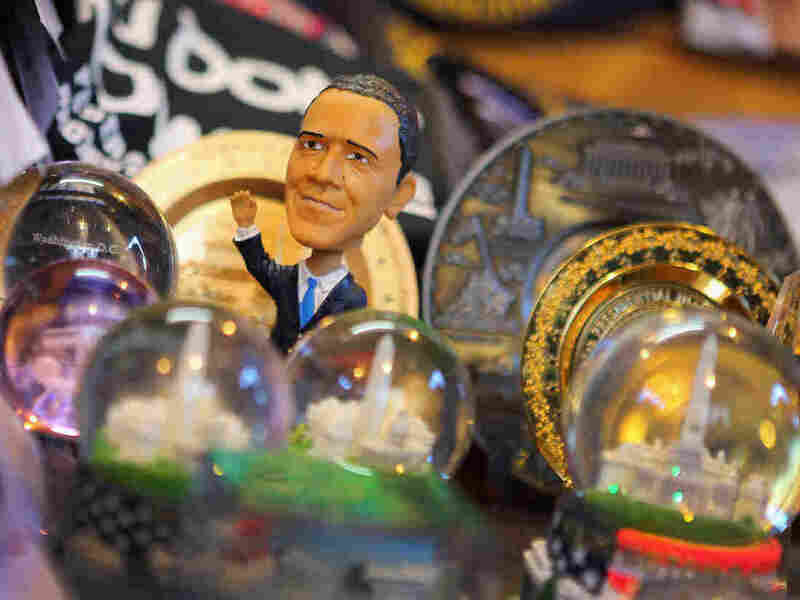 Souvenirs are available in Washington, D.C., as the city celebrates the inauguration. Though he and the vice president have already taken their oaths of office, President Obama is due this noon to stand outside the Capitol for his ceremonial swearing in and then to deliver his second inaugural address. -- Shortly after 11 a.m. ET. The president, vice president and their families take their seats on the podium. -- 11:35 a.m. ET. Myrlie Evers-Williams, civil rights activist and widow of slain Mississippi civil rights leader Medgar Evers, delivers the invocation. -- 11:45 a.m. ET. Vice President Biden repeats his oath of office. Supreme court Justice Sonia Sotomayor officiates. -- 11:50 a.m. ET. Singer James Taylor performs. -- 11:55 a.m. ET. President Obama repeats his oath of office. Chief Justice John Roberts officiates. -- Noon ET. The president delivers his inaugural address. -- 12:21 p.m. ET. Singer Kelly Clarkson performs. -- 12:26 p.m. ET. Richard Blanco reads his inaugural poem. At 44, he is the youngest poet to have this honor. He is also the first Latino to do so. -- 12:30 p.m. ET. The benediction by Dr. Luis León, pastor of St. John's Episcopal Church in Washington, D.C.
-- 12:34 p.m. ET. Singer Beyoncé peforms the National Anthem. Following the ceremony, the Obamas and Bidens join members of Congress for lunch in the Capitol. -- 2:32 p.m. ET. The president reviews troops outside the Capitol. -- 2:36 p.m. ET. The inaugural parade begins. -- 5:30 p.m. ET. The parade concludes. -- 6 p.m. ET. Inaugural balls begin. NPR's live coverage gets started at 10 a.m. ET. It will be broadcast on many NPR member stations and streamed on NPR.org. There's much more about the inauguration over at It's All Politics, including a trivia quiz.